The Eix Lagotel is a luxury family-friendly hotel in Playa de Muro, Majorca in Spain. The hotel is located between lush green forests of S’Albufera Nature Reserve and the pristine blue sea of Balearic Islands. The closest beach is just 800m away from the hotel complex. The property houses 3 beautiful outdoor swimming pools on its premises. 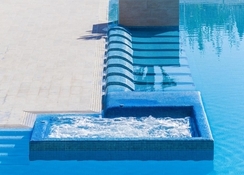 The architecture and interiors of the resort have been inspired by popular minimalism with hues of Spanish architecture. The hotel houses 340 tastefully designed guestrooms which are equipped with amenities to make the guests’ stay a luxurious and lavish experience. 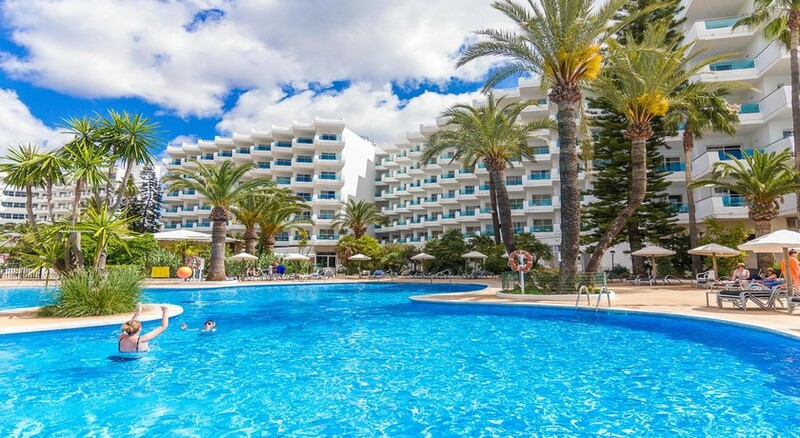 The hotel is located 20.2km away from the popular town of Majorca, offering the guests a brilliant opportunity to experience the life in this Spanish island. This is a great destination for vacationers looking for a beach vacation and make great memories. The Eix Lagotel is located 59.4km away from the Palma de Mallorca Airport. The nearest beach is 800m away from the property. The town of Majorca is located at a distance of 20.2km from the hotel and 1.6km away from the town of Playa De Muro town. Popular landmarks and tourist attractions like Natural Park S'Albufera de Mallorca, Alcudia Old Town, Rancho Grande Park Mallorca, Cala Barques, Cala Formentor Beach, Tomir Mountain, Cape Formentor and Lluc Monastery are within a distance range of 19km from the hotel. The Eix Lagotel has 340 tastefully decorated guest rooms which have been designed with utmost detail and elegance, incorporating minimalist and Spanish architecture. The rooms are categorised into 4 types based on various aspects and amenities. Single Room, Double Room, Family Room and Apartment are available options for accommodation. The rooms are equipped with sofa-bed, refrigerator, air conditioning, telephone, bed linens, towels, electronic safe, essential bath amenities, hair dryer, etc. The Eix Lagotel houses a snack bar, restaurant and bar that serve a wide range of international and local Spanish cuisines. Apart from that, the bar also serves a variety of local wines, beers, signature cocktails, alcoholic and non-alcoholic beverages. The guests can also try local restaurants and bars in towns of Ibiza and Playa De Muro. The Eix Lagotel houses 3 beautiful outdoor swimming pools, for both adults and children, which serves as an excellent option for recreational opportunities like pool games. There are live performances by the entertainment staff organised regularly at the resort where the guests can witness some brilliant performances. The guests can indulge in activities like squash, tennis, mini golf, cycling, hiking, table tennis, billiards, gaming, etc. The guests can also try water sports at the beach nearby. Had two weeks b&b with my two children 15 & 10 and it was fantastic. I really enjoy this hotel especially the drinks/ the beer was alright. My partner really enjoyed it too since she don’t like much hotels either. When we was leaving the hotel was going to go in refurbishment, can’t wait to visit the hotel again after the refurbishment. The hotel was clean and welcoming. The staff were really friendly and accommodating. Cocktails in the bar weren’t the best but the wine and beer was nice. Very varied food at every meal and always plenty available. Salads and fruit were always fresh. We had a wonderful time here and would return. Excellent holiday .. good food ...friendly staff....hope to go again! There isn’t really a hot tub though , it’s just a bath . Hotel lovely and staff friendly . Loved the adult only pool .